The Forward Bin Tipper (FBT1000-760) is a forklift attachment that converts an existing forklift into a portable bin tipper perfectly suited for cubic bins, pallet bins, or megabins. 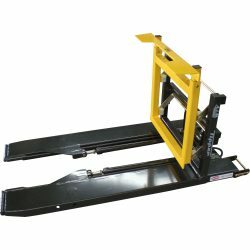 The FBT1000-760 provides fast-controlled, hydraulic tipping action and is designed for quick and easy fitting onto or removal from a forklift while the operator remains in the forklift seat. The Forward Bin Tipper is gentle on bins, extending bin life, and suitable for a wide range of solid or vented cubic bin sizes and types made from plastic or timber. The clear-view design does not obstruct vision of tines and the unique bin grab applies a firm grip on a bin when inverted. The Forward Bin Tipper’s 135 degree forward rotation ensures completed emptying of bin. It has a minimal loss of forklift load capacity and does not affect the forklift’s capacity to handle pallets or stacked bins. The FBT1000-760 is equipped with a safety catch which prevents tipping if the bin is not positioned correctly on the tines. The robust construction, powder-coat finish, stainless steel pivot pins, and long-life, zero-maintenance pivot bearings provide a trouble-free operation with minimal maintenance for years to come.